Experience the history, entertainment, food and personality of one of America's favorite cities! Green Bay is Wisconsin's oldest settlement, as well as the smallest city to host a National Football League team - where team history lurks around every corner! We will explore everything this beautiful city has to offer. You will enjoy once-in-a-lifetime experiences, from the rich culture of the Oneida Nation Reservation to a behind-the-scenes tour of Lambeau Field, home of the Green Bay Packers. Our westward route through Pennsylvania's mountains will lead us to our lodging for the evening at the Hampton Inn, Westlake, Ohio. This morning, after breakfast at our hotel, we will arrive at Amish Acres. Experience the lifestyle of the Amish through a guided house & farm tour, wagon ride tour, a documentary film and a family-style Threshers Lunch. We will then check-in to our accommodations in Kenosha, WI and have dinner on our own. After breakfast at our hotel, we will start our busy day with a visit to the Jelly Belly Visitor Center. Sweet sensations await you with the Jelly Belly Express Train and warehouse tour! Taste the magic of "The Original Gourmet Jelly Bean". You can even bring home a treat from their Candy Shoppe! We will then travel to our included lunch. After lunch we head to our next stop; a behind-the-scenes guided tour of Lambeau Field and the Green Bay Packers Hall of Fame. 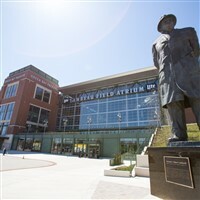 This new facility uses the latest technology, interactive displays and a treasure trove of artifacts to educate and inspire visitors about the rich history of the Packers. After checking-in to our accommodations for the evening, we will have an included dinner and entertainment in the comfort of our hotel. After breakfast, we will take a guided tour of the Oneida Nation Reservation. The Oneidas, one of the 11 tribes in Wisconsin, settled in this area in 1823. Rich history and culture is still alive on the reservation and you can explore the many visitor-friendly locations that tell the story of their past and current enterprises. After lunch we will visit the Green Bay Botanical Garden. This gorgeous destination has changing landscapes through the seasons. We will enjoy a guided tour and herb experience. Then we will satisfy our sweet tooth with a delicious visit to Seroogy's Chocolates. Founded in 1899, Seroogy's specializes in traditional homemade chocolates and fresh roasted coffee. Here you can sample your favorite chocolates and freshly brewed coffee! After freshening up back at our hotel, we head off to our dinner at Titletown Brewing Company. Located in the former Chicago & Northwestern Railroad Depot, this Green Bay iconic restaurant is famous for their mouthwatering fare and historic surroundings. After breakfast at our hotel, we will depart and head to South Bend, Indiana for a tour and visit to the Studebaker National Museum. Enjoy three levels of galleries and exhibits featuring one of the most famous car collections in the US. We will then check-in to our accommodations for the evening and have dinner on our own. We will have breakfast this morning at our hotel before checking-out and heading east towards our lodging for the night in Pittsburgh, PA. After we check-in to our hotel we will enjoy a dinner cruise aboard the Gateway Clipper. For over 50 years, this iconic riverboat has been sailing the Three Rivers with the picturesque city skyline as the backdrop. Experience a fun and unique evening out on the water, along with a wonderful meal and fabulous views! We will begin our journey home with a stop at the National Aviary in Pittsburgh. Here you will encounter exotic, rare and endangered birds up close as they venture through the tropical forest, lush wetlands, serene grasslands, and the rocky coastline of Penguin Point. Beautiful birds fly freely around visitors as you walk through indoor exhibits. For a truly unforgettable experience, we will enjoy the Live Free Flight Bird Show; close encounters with free-flying live birds combined with theatrical lighting, sound, and dynamic video for an inspiring multi-sensory experience. Our travels will bring us home later this evening.